Saint Louis IX (25 April, 1214–25 August, 1270), also called Saint Louis, was King of France from 1226 to his death. He established the Parlement of Paris. after his death he was canonised (declared a saint) in 1297 by Pope Boniface VIII. Jean de Joinville was a close friend of Louis and wrote a famous biography of the king, from which we have most of our information about him. 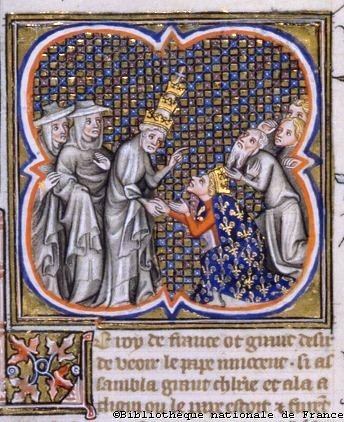 Two other important biographies were written by the king's confessor, Geoffrey of Beaulieu, and his chaplain, William of Chartres. While several other people wrote biographies about the king, only Jean de Joinville, Geoffrey of Beaulieu, and William of Chartres had reliable information. Louis was born at Poissy, near Paris. He was the son of Louis VIII of France and Blanche of Castile. Louis was eleven years old when his father died on November 8, 1226. He was crowned king the same year in the cathedral at Reims. Because Louis was so young, his mother ruled France as regent while he was a child. His younger brother Charles I of Sicily (1227–1285) was made Count of Anjou. On May 27, 1234 Louis married Marguerite of Provence (1221 – December 21, 1295), whose sister Eleanor was the wife of Henry III of England. At the age of 15 in 1229, Louis brought an end to the Albigensian Crusade after signing an agreement with Count Raymond VII of Toulouse. Louis's kindness towards the poor was much celebrated. He went on crusade twice, in his mid-30s in 1248 and then again in his mid-50s in 1270. In 1250, during his first crusade, Louis and his army was captured by Muslims in Egypt. Later on that year, they were released. To be released, he had to give back the land that he had taken over. Both crusades were complete disasters; after initial success in his first attempt, Louis's army of 15,000 men was met by overwhelming resistance from the Egyptian army and people where he was captured. After his release from Egypt, Louis spent four years in the crusader Kingdoms of Acre, Caesarea, and Jaffe. In 1252, Louis attempted an alliance with the Egyptians, for the return of Jerusalem if the French assisted with the subduing of Damascus. In 1253, Louis tried to seek allies from the Ismailian Assassins and the Mongols. Louis was Catholic, and he built the Sainte Chapelle ("Holy Chapel") on the Île de la Cité in the centre of Paris. It is thought that the French monarchy was trying to establish the kingdom of France as the "new Jerusalem." Louis IX tried to make France, which was seen as being a very religious place, a protector of the Church. It worked, and between the 12th and 13th centuries, France and the pope were very close. Robert, Count of Clermont (1256 – February 7, 1317). He was the ancestor of King Henry IV of France. During his second crusade, Louis died at Tunis, August 25, 1270, and his son, Philip III, replaced him as king. He may have died either of bubonic plague or dysentry. His body was taken to the French royal necropolis at Saint-Denis in Lyon. The cities of San Luis Potosí in Mexico, Saint Louis, Missouri, Saint-Louis du Sénégal in Senegal, Saint-Louis in Alsace, Lake Saint-Louis in Quebec, and the Mission San Luis Rey de Francia in California. Many places in Brazil are called São Luís in Portuguese are named after Saint Louis. Engraving representing the departure from Aigues-Mortes of King Louis IX for the Seventh Crusade (by Gustave Doré). 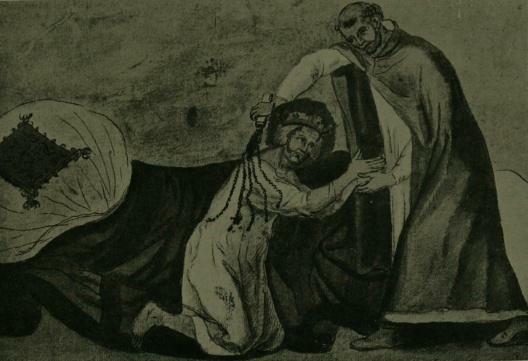 Louis IX allowing himself to be whipped as penance. 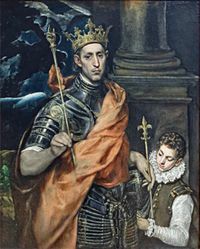 Saint Louis IX of France Facts for Kids. Kiddle Encyclopedia.